Clipboard software is useful to overcome the difficulty of saving more than one item to clipboard and restoring them back. They come with variety of features which help to use clipboard functionality effectively and efficiently. They can maintain clipboard items in a history and allows retrieving them quickly to any desired location or document. To know more about these software one can search Google using “clipboard software free download”, “clipboard software for windows 7”, “multiple clipboard software” or “copy current time to clipboard”. Ditto is a great clipboard software which allows storing unlimited number of items in a database. It allows pasting by double clicking on the item, dragging and dropping from item list and by pressing ctrl plus number. It allows searching and pasting previously copied entries. It is easy-to-use software and comes with plenty of settings. ClipX can store more than thousand items in clipboard and allows editing text clips. It allows saving entire clipboard to a file and re-loading it easily. It allows saving clipboards to history for each session. It allows enhancing its features using plug-ins. It allows clipping images and pasting them easily. 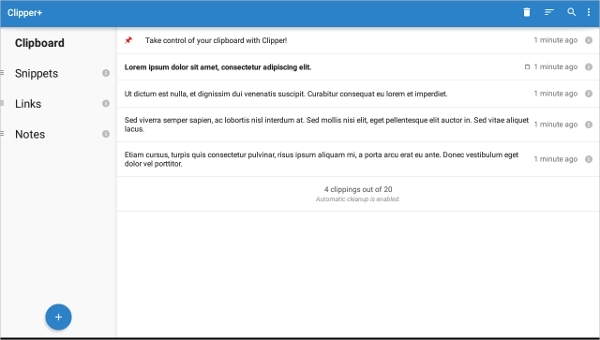 ClipMate allows clipping texts and images and stores them safely. Restoring clipped items is extremely easy and it enables viewing, editing, combining and managing items. It allows dragging and dropping clipped item to any document. It comes with hotkey feature to paste clipped items quickly. It allows copying clipped items to USB drive also. 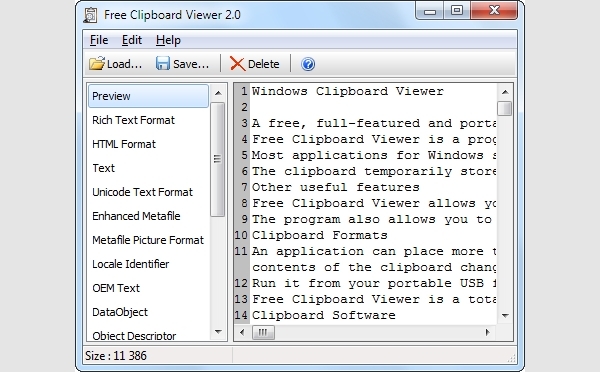 Free Clipboard Viewer allows storing clipboard items to a file and it can be restored on other computers as well. It is portable software and allows running from USB drive too. It allows clearing clipboard and free space. It allows saving pictures in different formats also. It is easy-to-use software. There is a lot of clipboard software available for various versions like Windows, Mac Os and Android. These software depends on platform and one should verify platform compatibility as well. The details of these software along with their features are mentioned below. One can go through them and understand better. 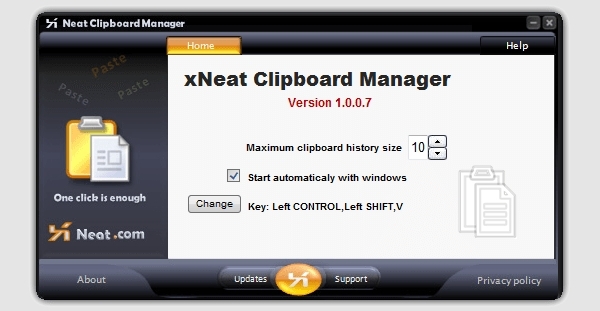 xNeat Clipboard Manager is simple to use and allows clipping and restoring items. It shows all the copied items in a menu and allows restoring them quickly. It allows copying texts, images, files and folders. It allows invoking clipboard using hotkey and setting clipboard history size. It allows deleting item from clipboard. ClipMenu allows storing up to eight clipboard types like texts and images. 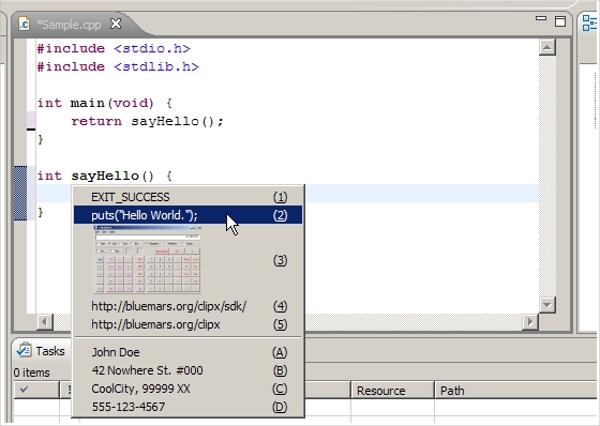 It allows invoking from menu or using hotkey. It is simple and easy-to-use software. It comes with preview bubbles feature which allows viewing entire text or image from clipboard. It allows last hundred items from history window option. 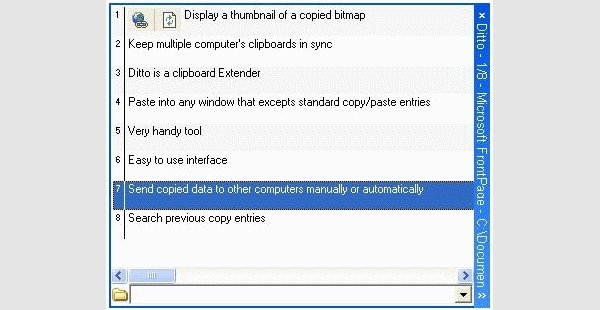 Clipper is robust clipboard manager which allows saving all items that one copies. It comes with best features to organize clippings and editing them. It allows easy access to saved clippings. It allows customizing clipboard collection, notification settings and user interface. It allows storing saved clippings in customized folders too. 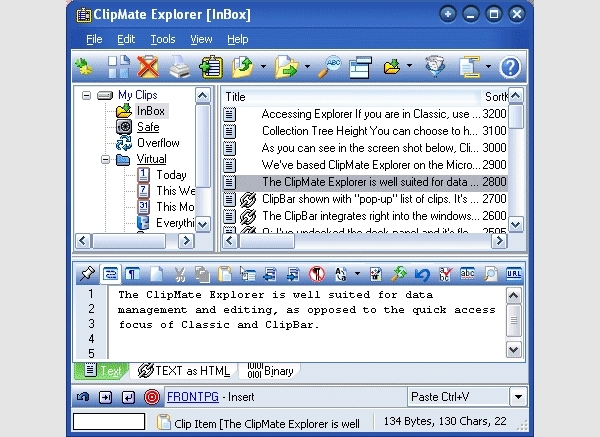 For windows version some of the clipboard software is “Yankee Clipper”, “Kana Clip”, “Clipboard History”, “PhaseExpress” and “Freeclip”. For Mac Os version some of the clipboard software is “Savvy Clipboard”, “PTHPasteboard”, “iClip”, “Clipboard Evolved”, “Cute Clips” and “CopyClip”. “Clipboard”, “Copy to Clipboard”, “Clipboard Manager” and “Native Clipboard” is some of the clipboard software for android application. Shapeshifter helps one to manage clipboard items efficiently. It allow saving multiple clipboard entries like text, images and HTML text. It comes with three modes with each mode lets one to set various settings for easy operation of clipboard items. It is simple to operate and come with intuitive layout. Clipboard software enables copying tons of items to clipboard easily. They allow saving clipped items in a file or database and allow restoring them quickly. They come with various options to clipping and restoring items. They are simple to use and very easy to understand. They allow storing many types of items like texts, images, email ids and many more. They allow customizing layout and themes as well. They allow viewing saved items before pasting them. To know more about their varieties one can search Google using “a10c clipboard’, “copy paste software”, “clipboard manager mac” or “clipboard manager windows 7”. How to Install Clipboard Software? Clipboard software is generally easy to install. One can follow the detailed installation instructions that are provided along with software download. The installation steps are illustrated with screenshots for easy understanding. One should install perquisites and verify system requirements for hardware and software mentioned in the website prior to installing the software. Clipboard Software allows copying many items like texts and images on the clipboard and stores them safely. 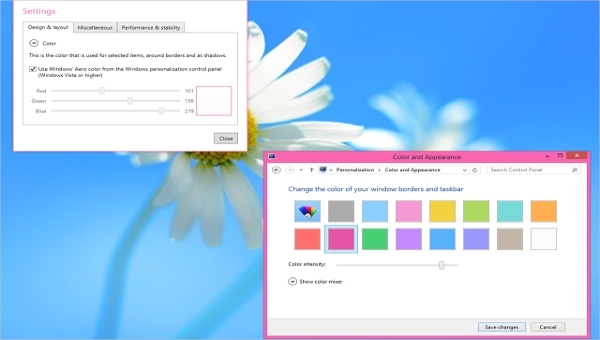 This feature helps one to restore different items to various folders or to any storage media. They allow viewing copied items before restoring hence one can easily identify the items and restore them to proper place in the hard drive. They can be invoked easily and does not use computer resources much. They allow searching and combining clip items. This features helps one while preparing a document where one needs to combine several contents. They allow saving hundreds of items and one can restore them at later period also.